Stop the count-up clock! 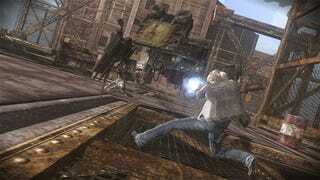 Upcoming role-playing-game, Resonance of Fate (AKA End of Eternity in Japan) has been dated. The tri-Ace developed title will be released January 28 in Japan. No word about the Western release. As we mentioned earlier, the game is set on the man-made spire of Basel. That's where the residents of Earth live in the future, now that we've polluted the planet to the point that it can no longer support human life or even vegetation. As with most future societies, Basel has an easily understood hierarchy of placement on the spire. The rich rest comfortably near the top, the dirt-poor peons near the bottom. Your team of Private Military Firm employed heroes-Vasheron, Zephyr and Leanne-naturally live closer to the bottom, amongst the gears and levers that power the giant machine that is Basel.